This is a post about a sandwich. Posted byMandy	 April 15, 2009 4 Comments on This is a post about a sandwich. I bought a Celebration Field Roast for Easter dinner, but I didn’t eat much of it because I was too stuffed with all of the delicious side dishes my mom made. Since I am the lone vegetarian, no one shared it with me, but everyone did sample it and said it was tasty. I liked the roast and I smothered it with my mom’s homemade milk gravy. I came home with almost a full Field Roast and I was unsure what to do with it. When in doubt, make sandwiches! I just love sandwiches. I think they are a wonderful thing to eat. This sandwich was pretty darn good and I might make it for tomorrow’s lunch as well. 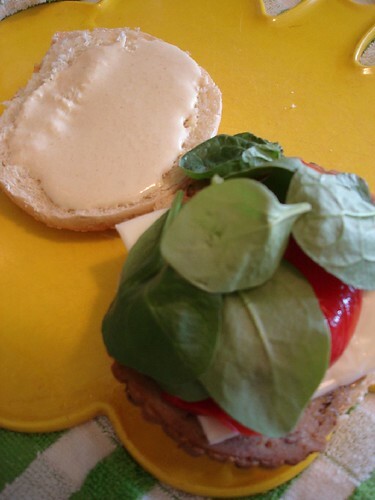 What we have here is a sesame seed bun, two slices of grain roast, a slice of Cabot American cheese, a sweet red pepper, some spinach, and special sauce. I think red onions would have been great on this, but I was too lazy to cut one. As for the special sauce, I mixed Vegenaise, horseradish, Chinese mustard, and a squirt or two of Ken’s Lite Accents Honey Mustard dressing. This sauce was extremely tangy and tasty and I think I will use it again on meat analogs again. All and all the sandwich was a success. I would recommend anyone trying the Celebration Field Roast. Locals, I picked mine up at the North County Co-Op. Polka dots, enchiladas, and frogs. Sweet! Looks scrummy, I’ll have to pick one up. looks yummy but i’m dumb what’s a field roast made of and if it was a meat what would it taste like? You are not dumb 🙁 It is a wheat meat and it sorta reminded me of roast beef in texture. Mmm, special sauce and meat analogs.